Parliament sent British soldiers to Boston on October 1, 1768, to help tax collectors enforce the Townshend Acts, which were enacted in 1767. Resentful of British troops occupying the city, Bostonians tormented and harassed the soldiers after their arrival. 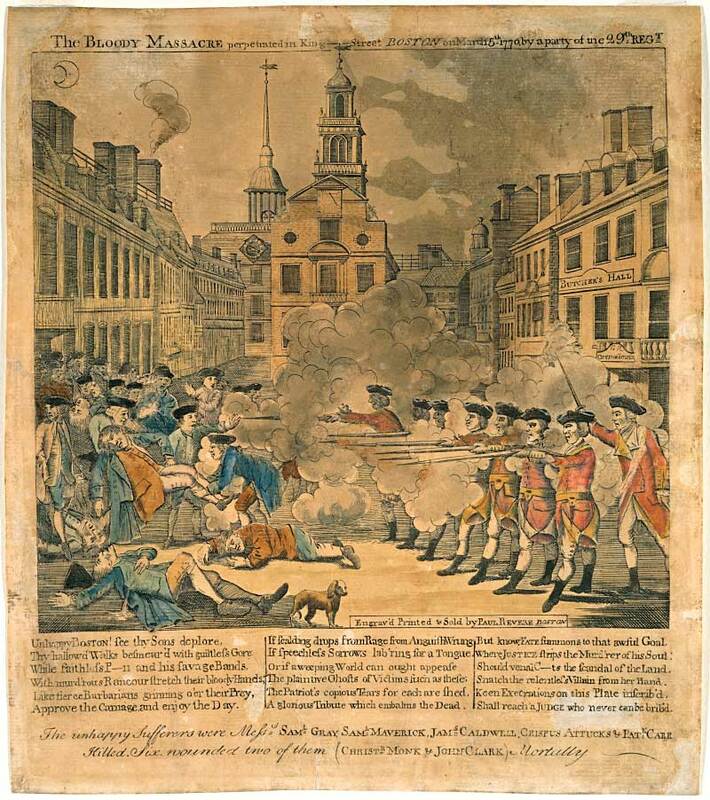 Resentment against the British troops in Boston grew to a climax on the evening of March 5, 1770 when a group of Bostonians began hassling a lone sentry guarding the Customs House. A crowd began to form as the confrontation between the sentry and the Bostonians continued. Captain Thomas Preston led seven soldiers from the Twenty-ninth Regiment to reinforce the sentry. The crowd began advancing on the soldiers and pelted them with sticks and snowballs. As hostilities escalated, a British soldiers fired his musket into the crowd. Believing that Captain Preston had given the order to fire, other soldiers also fire into the crowd. Three Bostonians were killed immediately and two others died later from their wounds. Six others were wounded, but survived. Captain Preston and four of his men were arrested and indicted for murder. John Adams defended the British soldiers at trial. Adams proved that the soldiers did not fire into the crowd until they were physically attacked and all but two were acquitted. Two soldiers found guilty of manslaughter were branded on their hands and released. Hoping to avoid further inflammatory incidents, the British removed their troops from Boston after the altercation. One of the men killed by the British soldiers was Crispus Attucks, an escaped slave of African-American descent. Some witnesses claimed that he was the first victim shot. A monument honoring Attucks’ contribution to struggle for freedom was erected in Boston in 1888.